If you create an account on the Site, you are responsible for maintaining the confidentiality of your account and password and for restricting access to your computer, and you agree to accept responsibility for all activities that occur under your account or password. Unless otherwise noted, all intellectual property and other rights in all Contents (as defined below), including without limitation all copyrights, trademarks, trade dress and/or other intellectual property owned, are controlled or licensed by Lil Hustler Tackle Company, one of its affiliates or by third parties who have licensed their materials to Lil Hustler Tackle Company and are protected by state, U.S. and international intellectual property laws. The compilation (meaning the collection, arrangement, and assembly) of all Contents on this Site is the exclusive property of Lil Hustler Tackle Company and is also protected by U.S. and international copyright laws. Lil Hustler Tackle Company expressly reserves all intellectual property rights in all programs, products, processes, technology, Contents and other materials which appear on this Site. Access to this Site does not confer and shall not be considered as conferring upon anyone any license under any of Lil Hustler Tackle Company intellectual property rights. The LIL HUSTLER TACKLE COMPANY name and logo and all related product and service names, design marks and slogans are the trademarks or service marks of Lil Hustler Tackle Company. No trademark or service mark license is granted in connection with the materials contained on this Site. Access to this Site does not authorize anyone to use any name, logo or mark in any manner. All materials, including images, text, illustrations, designs, icons, photographs, programs, software, music clips or downloads, video clips and written and other materials that are part of this Site (collectively, the “Contents”) are intended solely for personal, non-commercial use. To the extent that the Site identifies any items for download, You may download or copy such downloadable materials for your personal use only. No right, title or interest in any downloaded materials or software is transferred to you as a result of any such downloading or copying. You may not reproduce (except as noted above), publish, transmit, distribute, display, modify, create derivative works from, sell or participate in any sale of or exploit in any way, in whole or in part, any of the Contents, the Site or any related software. All software used on this Site is the property of Lil Hustler Tackle Company or its suppliers and protected by U.S. and international copyright laws. The Contents and software on this Site may be used only for your personal entertainment purposes. Any other use, including the reproduction, modification, distribution, transmission, republication, display, or performance, of the Contents on this Site is strictly prohibited. This provision survives termination of this Agreement. Users are prohibited from violating or attempting to violate the security of the Site, including, without limitation, (a) accessing data not intended for such user or logging onto a server or an account which the user is not authorized to access; (b) attempting to probe, scan or test the vulnerability of a system or network or to breach security or authentication measures without proper authorization; (c) attempting to interfere with service to any user, host or network, including, without limitation, via means of submitting a virus to the Site, overloading, “flooding,” “spamming,” “mailbombing” or “crashing;” (d) sending unsolicited email, including promotions and/or advertising of products or services; or (e) forging any TCP/IP packet header or any part of the header information in any email or newsgroup posting. Violations of system or network security may result in civil or criminal liability. Lil Hustler Tackle Company will investigate occurrences that may involve such violations and may involve, and cooperate with, law enforcement authorities in prosecuting users who are involved in such violations. You agree not to use any device, software or routine to interfere or attempt to interfere with the proper working of this Site or any activity being conducted on this Site. You agree, further, not to use or attempt to use any engine, software, tool, agent or other device or mechanism (including without limitation browsers, spiders, robots, scripts, crawlers, avatars or intelligent agents) to navigate or search this Site other than the search engine and search agents available from this Site and other than generally available third party web browsers (e.g., Firefox, Chrome, Microsoft Explorer, Safari, etc). Additionally, you agree that you will not take any action that imposes or may impose (in our sole discretion) an unreasonable or disproportionately large load on our infrastructure or that may interfere or attempt to interfere with the proper working of the Site. You may not frame or utilize framing techniques to enclose any trademark, logo, or other proprietary information (including images, text, page layout, or form) of Lil Hustler Tackle Company without express written consent. You agree to comply with all applicable laws and regulations. This provision survives termination of this Agreement. 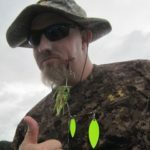 All comments, testimonials, feedback, and other submissions disclosed, submitted or offered to Lil Hustler Tackle Company on or by this Site or otherwise disclosed, submitted or offered in connection with your use of this Site (collectively, the “Comments”) shall be and remain Lil Hustler Tackle Company property. Such disclosure, submission or offer of any Comments shall constitute an assignment to Lil Hustler Tackle Company of all worldwide rights, titles and interests in all copyrights and other intellectual properties in the Comments. Lil Hustler Tackle Company does not regularly review posted Comments, but does reserve the right (but not the obligation) to monitor and edit or remove any Comments submitted to the Site. You grant Lil Hustler Tackle Company the right to use the name that you submit in connection with any Comments. You agree not to impersonate any person or entity, or otherwise mislead as to the origin of any Comments you submit. You are and shall remain solely responsible for the content of any Comments you make and you agree to defend, indemnify and hold harmless Lil Hustler Tackle Company and its affiliates for all claims resulting from any Comments you submit. Lil Hustler Tackle Company and its affiliates take no responsibility and assume no liability for any Comments submitted by you or any third party. This provision survives termination of this Agreement. While Lil Hustler Tackle Company appreciates that consumers may want to share their ideas related to fishing products, Lil Hustler Tackle Company does not accept any unsolicited information, material, or other communication related to intellectual property including, but not limited to, any comments, suggestions, drawings, models, materials, and/or descriptions of ideas related to manufacturing, and/or marketing products or services. Unless express written approval from Lil Hustler Tackle Company is granted, any unsolicited information, material, or other communication provided to Lil Hustler Tackle Company or its affiliates by electronic mail or otherwise, including, but not limited to, any concepts, techniques, know-how, questions, comments, suggestions, data, and/or the like will be treated as non-confidential and non-proprietary information. Lil Hustler Tackle Company or its affiliates are not obligated to maintain any unsolicited information, material, or other communication in confidence. Any unsolicited information, material, or other communication may be used by Lil Hustler Tackle Company or its affiliates for any purpose including, but not limited to, broadcast, disclosure, posting, publication, reproduction, solicitation, and/or transmission without compensation to the person providing such information, material, or other communication. Further, any unsolicited submission to Lil Hustler Tackle Company or its affiliates including, but not limited to, prototypes, marketing materials, and/or the like will not be returned to the sender. This provision survives termination of this Agreement. You agree to defend, indemnify and hold harmless Lil Hustler Tackle Company and its affiliates from and against any and all claims, damages, costs and expenses, including attorneys’ fees, arising from or related to your use of the Site, including all Contents available from or accessed through the Site. This provision survives termination of this Agreement. This site is provided by Lil Hustler Tackle Company on an “as is” and “as available” basis. Lil Hustler Tackle Company makes no representations or warranties of any kind, express or implied, as to the operation of the site or the information, content, materials, or products included on this Site. You acknowledge, by your use of the LilHustler.com website, that your use of the Site is at your sole risk. UNDER NO CIRCUMSTANCES AND UNDER NO LEGAL OR EQUITABLE THEORY, WHETHER IN TORT, CONTRACT, STRICT LIABILITY OR OTHERWISE, SHALL Lil Hustler Tackle Company OR ANY OF ITS AFFILIATES, EMPLOYEES, DIRECTORS, OFFICERS, AGENTS, VENDORS OR SUPPLIERS BE LIABLE TO YOU OR TO ANY OTHER PERSON FOR ANY INDIRECT, SPECIAL, INCIDENTAL OR CONSEQUENTIAL LOSSES OR DAMAGES OF ANY NATURE ARISING OUT OF OR IN CONNECTION WITH THE USE OF OR INABILITY TO USE THE Lil Hustler Tackle Company WEBSITE, INCLUDING, WITHOUT LIMITATION, DAMAGES FOR LOST PROFITS, LOSS OF GOODWILL, LOSS OF DATA, WORK STOPPAGE, ACCURACY OF RESULTS, OR COMPUTER FAILURE OR MALFUNCTION, EVEN IF AN AUTHORIZED REPRESENTATIVE OF Lil Hustler Tackle Company HAS BEEN ADVISED OF OR SHOULD HAVE KNOWN OF THE POSSIBILITY OF SUCH DAMAGES. UNDER NO CIRCUMSTANCE SHALL Lil Hustler Tackle Company’S AGGREGATE LIABILITY TO YOU (WHETHER UNDER CONTRACT, TORT, STATUTE OR OTHERWISE) EXCEED THE GREATER OF (i) THE AGGREGATE AMOUNT PAID BY YOU TO Lil Hustler Tackle Company DURING THE ONE MONTH PRECEDING THE DATE THAT THE CLAIM ARISES OR (ii) TWO DOLLARS ($2.00). THE FOREGOING LIMITATIONS WILL APPLY EVEN IF THE ABOVE STATED REMEDY FAILS OF ITS ESSENTIAL PURPOSE. THIS SECTION SHALL SURVIVE TERMINATION OF THIS AGREEMENT.